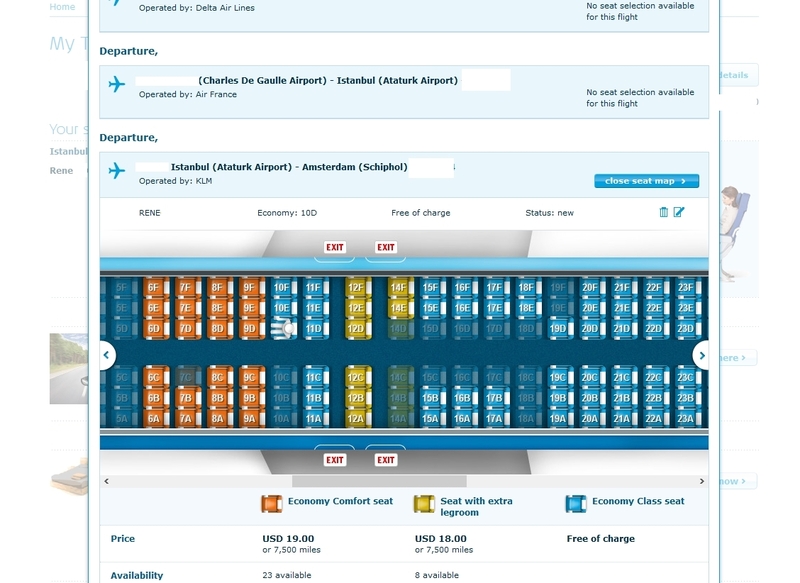 DELTA confirmation numbers now WORK on AF & KLM web sites! For a very long time, when you had a reservation with an AF or KLM included segment, booked via Delta, you had to get your AF/KLM confirmation code to see the seat map. You could ONLY see the seat map if you were in business class. So, you could ask a Delta rep for this number to use on the web site or you could go to AirFrance.com/us and put in the Delta ticket number and your name and you would then be able to see the corresponding AF/KLM confirmation number assigned to your ticket from Delta. Well now, it would seem, that has all changed. 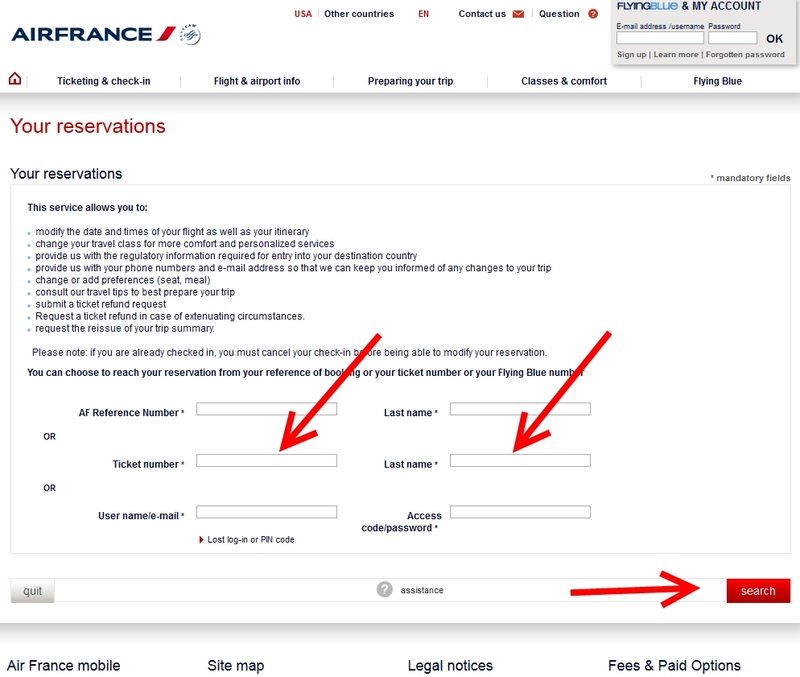 You can simply use your Delta confirmation on both AirFrance.com and KLM.com with your last name and pull up your reservation. Bingo! Delta will tell you this is airport controlled. Wrong! With a Flying Blue number you WILL be able to pick seats and use your Delta confirmation number to pull up the booking. As you can see, you can pay for EC seats or exit row with USD or FB points if you have some. If you are a Delta Medallion I would personally not do that. I would grab the best seats FREE in coach so you at least have a “good” seat and then once you get “over there” go to the KLM crown room or AF lounge and see about getting exit or EC for free. They will give you a snaky look, but if you remind them of your Skyteam elite status and explain how you would so much appreciate it, they will most of the time help you out. ← #Delta news that makes me a HAPPY FLYER today! Thanks so much for this post! I was able to pull up a Delta award booking I did recently on KLM via the KLM website using the Delta confirmation number. I was able to see what seat i was in and change it without a KLM flying blue number. Unfortunately though, seat guru did not have the plane configuration of the 737H in their listings. I recently got Platino on Aerolineas Argentinas and was going to add that to my booking, but being able to access it via the KLM website with the Delta number is worth keeping it with Delta for now. Any advice on how to maximize the elite status with Aerolineas? Would I be able to get an Economy Comfort seat for free or take an extra bag at no charge? I am flying between countries in Europe on KLM. Yeah, Flying Blues own Elites are stuck in the back and Medaillions should beg for free upgrades. @Ralph – I agree the Delta is much better to it’s elites than KLM is. I was FB Platinum for a year. Just horrible. Also no free upgrades to EURO biz? What is up with that FB? BTW, not saying you can ask for free BIZ upgrades, just upgrade to say EXIT or EC seats. All free to DL medallions on DL flights! Yes, I noticed, in doing some TATL award searching this week there DL.com was showing no AF inventory on overwater flights, only inter-European. And the KL space that was showing was phantom space, DL agents couldn’t book it. When will DL tell us what is going on with their JV partner award inventory? This nonsense has been going on too long. I have a Virgin Australia flight next month and no way to get a seat assignment from SYD to BNE. Do you know if there’s something similar you can do. The Delta agent on the Platinum line said she can’t even see a seat map so there’s no way for her to book a seat for that segment. No joy there. I’m already a Virgin America Elevate member, but that seems to be irrelevant. You can’t join Virgin Australia’s Velocity program unless you are a resident of Australia (or about 10 other conties in the area). You can’t find your itinerary on Virgin Australia based on the Delta confirmation number. You can only look up your itinerary there by conf # or Velocity # (so the ticket # won’t work either).